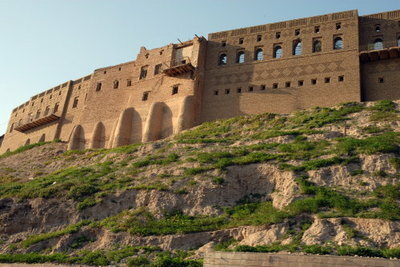 The Citadel of Hewlêr (Erbil), ca. 5,000 years BCE, Kurdistan – Photograph 2005 Via Wikimedia Commons. Iranian president Mahmoud Ahmadinejad will travel soon to the Kurdistan Regional Government (KRG) for a discussion of border disputes and trade relations, reports the Iraqi news agency Aswat al Iraq. Ahmadinejad will meet with KRG president Massoud Barzani, who visited Tehran at the end of October with a delegation of KRG ministers and governors. Barzani, as pointed out in THE WEEKLY STANDARD by Frederick W. Kagan, Kim Kagan, and Marisa Cochrane Sullivan, was considered previously "the Kurdish leader most staunchly opposed to Iran." In Tehran, Barzani and Iranian foreign minister Ali Akbar Salehi announced that Kurdish rebel actions against Iran, along the border with the KRG, had ended. Iran is looking for auxiliaries to its considerable and menacing influence over the Iraqi central government, perhaps out of mere desire for aggrandizement. But Tehran may also fear that Arab Shias in Baghdad will prove a troublesome partner in its anticipated alliance of Shia-ruled Middle East states, once the U.S. leaves. Iraq's Shias, a majority of the country's population, do not accept the political model of the Iranian clerical state, or "vilayet-e faqih" (governance by religious jurists). Hostility between Iranian and Iraqi Arab Shias, as described by Nathaniel Rabkin writing for THE WEEKLY STANDARD in 2007, is reflected in religious literature produced by Iraq's Shia religious authorities, or marjae. And of course the Iraq-Iran war of 1980-88 has not been forgotten. An AP report in early November quoted a 36-year-old Iraqi Shia sheep trader, Fouad Karim, who lives in Mandali, a mixed Kurdish and Arab town on the northeastern border with Iran: "We hated the Iranians. And there are still bad feelings. The government should not tolerate any Iranian interference, as our anger against them only gets worse when we hear about their deeds." Still, as the AP noted, multitudes of Iranian pilgrims have gone to the Shia holy sites at Kerbala and Najaf in Iraq, and Iranian-produced consumer goods are offered for sale widely in Iraq. While Iran no doubt hopes to aggravate tensions between Iraq's Kurds and Baghdad, it has a poor history of dealing with its own Kurds, including terrorist attacks on Kurdish leaders abroad, and shelling of Kurds on Iraqi soil in July. But Iran already operates two consulates in the KRG, in Erbil and in Sulaymaniyah. Iran may also want to exploit Kurdish tensions with Turkey, since the latter country entered the NATO anti-missile defense system. Iran has threatened to retaliate against Turkey if the U.S. or Israel act against Iran's nuclear ambitions. The new Iranian intrigues in the KRG began just as animosity between the Kurds in Erbil and the government in Baghdad had worsened over petrochemical production, including in Kirkuk, which has prolific oilfields. Baghdad argues that hydrocarbons from the KRG belong to the whole Iraqi nation. The most recent Quarterly Report to Congress by the Special Inspector General for Iraq Reconstruction (SIGIR), dated October 30, 2011, counts KRG contracts with more than 40 international oil and gas companies. SIGIR offers a comparison of 45 billion barrels of oil and 100-200 trillion cubic feet of natural gas said by the KRG to be available in its territory with estimates by Baghdad of 143 billion barrels of oil and 112 trillion cubic feet of natural gas in Iraq as a whole. The largest number of oil and gas agreements with the KRG have involved investors from Canada (14 licenses) and South Korea (12 licenses), with U.S.-based enterprises accounting for 8 licenses. Other interested parties are based in Kurdistan itself, Turkey, Britain, the United Arab Emirates, Austria, Hungary, Norway, China, Australia, India, France, Russia, Moldova, and Spain. In February 2011, thanks to an interim agreement with Baghdad, the KRG resumed exporting oil, which had stopped in 2009. Firms investing in the KRG's energy potential were typically small (except for the Chinese SINOPEC and Spanish Repsol), until ExxonMobil became the first "supermajor" firm to announce, at the end of October, that it had signed accords with the KRG for oil and gas exploration at six locations. The Baghdad government responded angrily, claiming that ExxonMobil acted without the authorization of U.S. authorities. Iraqi second deputy prime minister for energy affairs Hussain Al-Shahristani, who is independent of any party, denounced the ExxonMobil involvement with the KRG as illegal. The latest SIGIR report notes that Hess Corporation, an American energy company, was banned by the Baghdad authorities from a fourth round of licensing for 12 new exploration blocks elsewhere in Iraq after it signed a contract with the KRG. Baghdad has further warned it would cancel approval of exports by ExxonMobil from its large oilfields near Basra in southern Iraq, as retaliation for the company's KRG efforts. In mid-November, Royal Dutch Shell withdrew from development talks with the KRG, to protect its assets in southern Iraq, which include a natural gas project worth up to $17 billion. Baghdad then threatened to hand over ExxonMobil's southern holdings to Shell. Baghdad has expressed concern that Chevron and the Italian firm ENI may enter Kurdistan. Iraqi Kurdistan has succeeded in attracting such outside investors because of its security. SIGIR reports that no American soldier or civilian has been killed there since 2003, and only two major terrorist bombings have taken place in eight years. The KRG has accomplished an important social advance in adopting legislation prohibiting domestic violence, including the practice of female genital mutilation, which was widespread in Kurdish culture, forced marriage, child marriage, arranged marriage between young women and old men, marriage by trade-off of women between different families, demands for dowries, forced divorce, and marriage as a payment in lieu of money to settle blood feuds. As SIGIR points out, on August 30, 2011, the KRG became the first Iraqi region to provide its residents with electric power 24 hours daily, and exports electricity to Kirkuk. By contrast, Baghdad, on average, has power only four hours each day. The KRG's positive example of steady improvement in its people's lives began when it came under U.S. protection in 1991, during the presidency of George H.W. Bush, and it has achieved more since George W. Bush acted to remove Saddam Hussein in 2003. But according to Kurdish blogger Shwan Zulai, "The KRG was taken by surprise when . . . the scale of the U.S. drawdown became clear." The prospect of major U.S. and foreign hydrocarbon enterprises operating under Iranian "protection" in the KRG should indicate that something had gone very wrong. Much remains to be done in extirpating corruption and other abuses in the KRG, but if it falls into Iranian hands, or its resources are usurped by Baghdad, or both, it will be an indictment of Obama's policy of a rapid and heedless ending of the U.S. presence in Iraq.